After having the nieces over for a long weekend, Julia and I have both come down with the flu (from what I hear it's a bad flu season this year). I am trying to use the times when I'm not having the chills, shakes, or sweats, to get some inking done. While being sick, it's always nice to have the companionship of a dog. Autumn, or Anatolian Shepherd, has been very good about cuddling with us when we take naps and wrap up in blankets on the couch. She also seems to be more patient if it takes us longer to get to the door to let her out or back in..I think she can tell we are under the weather. She has taken to jumping up on our table on the deck where she can get a full bird's eye view of our neighbour's yards. I caught her with the camera today. Silly dog. The trick now is going to be getting her to not do that in summer when we have outdoor parties and picnics! ComiXology was kind enough to do a podcast interview with me. You can listen to that here. While I can't share much about the official Board Game or the RPG yet, I have been toying with the idea of also doing a release of the game Saxon and Kenzie are playing in the epilogue of Fall 1152. 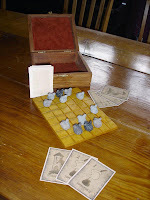 I had to reverse engineer the game rules and play to match (or at least coincide) the images from the story. I have handcrafted this initial set that I hoped to playtest with pals this weekend. Unfortunately due to the flu, looks like it will have to wait. I was directed to the photobucket page of an artist that goes by SillyNate. It's a great take on the trio and if SillyNate is reading, thanks for the fan art, and I'd be happy to plug your website in this post. Hi David, I wanted to tell you I think your work is amazing. 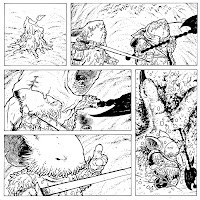 James Gurney emailed me this morning and told me how cool Mouse Guard is. Mouse Guard is exactly the type of thing I'm always looking for.I'm going to set up a link to your blog from mine, if that's OK. I hope you're feeling better soon. Love the Calgary piece! Thanks for posting that. Wow, your work is just amazing! 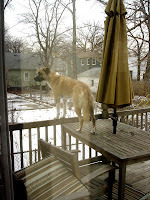 Hope you are feeling better, I too have an anatolian shepherd dog and he has his own blog. Check it out when you have a free moment, might give the you inspiration to do some drawings.